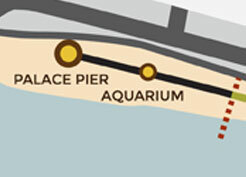 The large dot shows the position of the ‘Palace Pier Station’ from 1883 to 1930 while the smaller dot shows the repositioned and renamed ‘Aquarium Station’ from 1930 to the present day. The red dotted line shows the approximate position of the old Chain Pier. Whilst there are one or two exaggerated engravings showing the original line there would appear to be no photographs other than that of Magnus and invited guests posing prior to the official opening. 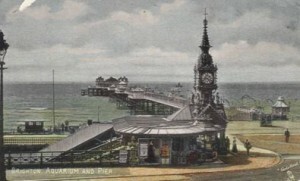 The rather nice colour postcard on the left shows the Aquarium entrance and the Palace Pier. 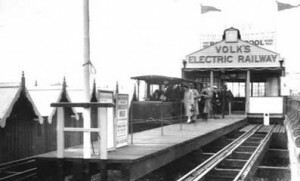 The interesting thing as far as Volk’s Railway is concerned is the car standing in the Palace Pier Station. It can be seen at the left hand side of the picture. The picture to the right shows the station with two cars standing side by side. 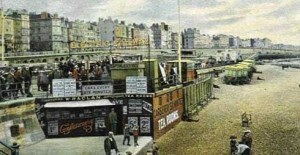 The picture is taken from a postcard published not long after after the line was extended to Black Rock. When built the station was known as ‘Aquarium’ but with the completion of the Palace Pier the station was renamed after the famous landmark. This delightful tinted postcard shows the cluttered surroundings of the original station complete with subterranean tea rooms. A plethora of signs extolling the joys of travelling on the railway brighten up the surroundings, whilst a large sign proclaiming the ‘ELECTRIC RAILWAY’ has been fitted between two poles above the entrance to the platforms. A car is stabled in the south siding, no doubt waiting to fulfill the promise of a car every six minutes. 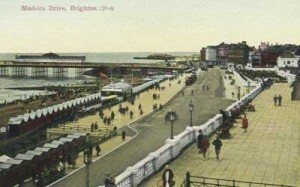 In September 1929 Magnus was given notice to move his station eastwards as the site was required for the proposed development of the western end of Madeira Drive. This interesting ‘aeroplane view’ shows the Palace Pier end of the line. The red dot marks the Palace Pier station site complete with a white-roofed car in the platform. 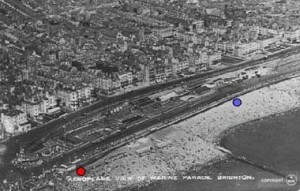 The blue dot marks the site of the present station thus showing how much of the line was lost during the widening of Madeira Drive in 1930. Had it gone ahead the new bathing pool would have been constructed on the sea-side of the old station, but in the end a site at Black Rock was chosen which meant the railway cutting back at the eastern end. 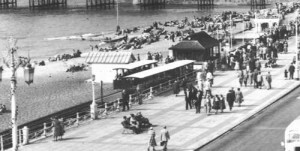 Had the powers that be not proposed the Palace Pier site for the bathing pool it is quite likely that Magnus could have simply shifted the line seaward alongside the new alignment of Madeira Drive, and therefore have retained the full length of line at this point. 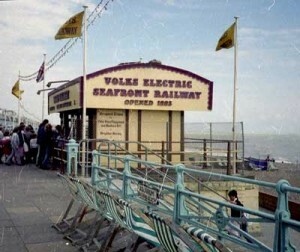 It is a long stated aim of the Volk’s Electric Railway Association to see the line restored at least part way westwards towards the pier. 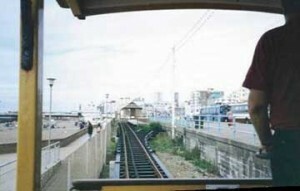 Two views that span the old Palace Pier Station and the new Aquarium Station. 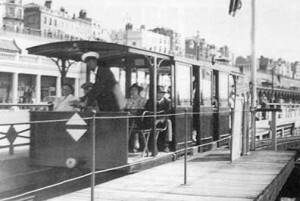 To the left, Car 7 stands in the old station in a picture that clearly illustrates the closeness of the original station to the Palace Pier. The car is heavily loaded and is no doubt waiting for the other car to arrive off the single line before it leaves for Black Rock. As a result of the shortening of the line Magnus constructed a much grander station building, possibly to make it more visible from the pier, and this is seen on the right. Containing both a ticket office and waiting room the wooden building certainly stood out. It is interesting to see that the running rails are fitted directly to longitudinal timbers supported by cross-beams, as opposed to the original station’s more conventional shingle and ballast trackbed construction. Also visible is the flat metal strip alongside the seaward side running rail that served as the third rail. 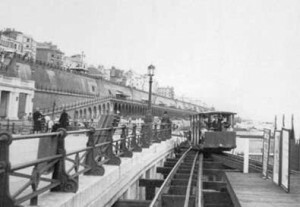 The upper walkways along Madeira Drive have always been a good place from which to watch the little electric cars gliding along the track towards Halfway. This tinted postcard shows Madeira Drive in the 1930s with Volk’s 1930 station building standing prominent at the now renamed ‘Aquarium Station’. 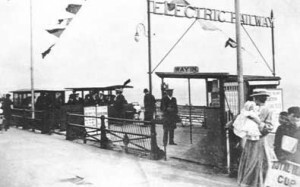 The move eastwards took the station away from the coach parking area and the pier which resulted in a 20% drop in revenue from passengers taking an ‘impulse’ ride on the railway. It is interesting to see where the widening of Madeira Drive stopped and a sort of dog-leg in the pavement took pedestrians back to the old alignment. As will be seen later, Magnus left his line on the old alignment and then swung it seaward through a double curve to attain the new alignment into Aquarium Station. The elusive question is when the second stage of the widening took place – if you have any clues we would appreciate an email. 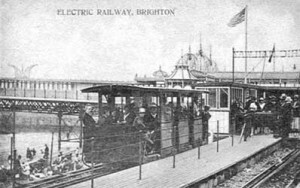 The wooden station building was not suitable to survive the rigours of wartime Brighton and had no use in the defence of the seafront so was demolished in 1940. 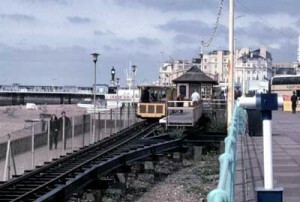 In 1947 the lines new owners, Brighton Corporation, utilised a redundant tram shelter as a replacement station building. A much less significant structure the building gets a bit lost amongst the other attractions of Madeira Drive. Three cars stand in the station waiting the rush of afternoon passengers while the unseen competition lurks between the station and the pier in the form of motor coaches offering holiday-makers such delights as an afternoon mystery tour or a trip to Wannock Gardens. Picture left:-Making its way along the gantry and into the south platform road this car will soon deposit its passengers at Aquarium where they will be able to take a leisurely stroll along the prom to the Palace Pier. Sharp eyes will see that the driver has one hand on the brake wheel and the other on the roof mounted speed controller. In the picture on the right another car arrives in the north platform road with the driver intent on the brake to stop him in the right place. The white and red diamond on the car’s dashboard indicates that another car is following and the next eastbound car should not depart until it arrives. Perhaps the biggest change since 1948 has been the loss of the north platform road. The rails and point were removed in the mid 60s and a lengthened platform was put in which, in its current form, effectively blocks future access to the old northern platform road. The picture below shows a drivers-eye-view of the approach to Aquarium up the long gantry. The removed north platform formation branched off to the right but now just a single pair of running rails lead into the south platform. Since this photograph was taken the gantry has been rebuilt in the same style and a mesh walkway has been added between the rails to make maintenance on this section a little easier. The final picture in this section shows the station building in the 1990s. Not very subtle but highly visible!